If you’re not as crochet or knit savvy as some others, you’ll surely be in luck with this fun, DIY no-sew scarf tutorial. This quick and easy 10 minute DIY scarf is a fun and creative way to design something unique and you’ll most likely be able to complete this project in under 10 minutes! Believe it or not, you won’t be needing any sort of knitting or crochet needles for this yarn craft. And the best part about this no-sew, non-crochet, non-knit tutorial is that anyone can make it! Set your bar stools side by side and tape the end of your yarn to the stool, leaving a 2” yarn tail. Wrap the yarn all the way around the stool. I’ve found that using kitchen chairs or bar stools can make the perfect double (and possibly triple) infinity scarf. Wrap the material around the chairs to a thickness of your liking. To get the best out of your beautiful variegated baby yarn, you may have to wrap your yarn around a couple of times. Once you’ve determined the thickness of the scarf, carefully remove your scarf from the bar stools and lay it down on a flat surface. Make sure your two loose ends are in the same place (if not, cut one end so they match up). 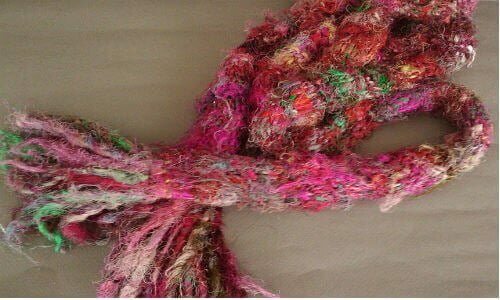 Cut a piece of yarn (roughly 4” long) and tie a double knot around the entire scarf, securing your two loose ends. Trim the yarn tails to approximately 1” each. Using a double knot, secure the remainder of your skein approximately 1” from the knot you just tied in order to secure the scarf. Wrap all loose ends. Finish your wrap by tying a double knot around the scarf. Wrapping approximately 2” at the ends will secure the whole scarf. Optional: For added embellishments, you can cut a tail at each end of the scarf approximately 3-4” long. Finger weave the yarn tail to avoid the material from being tangled. I like to twist the scarf and then wrap it around my neck two or three times depending on how eclectic I’m feeling. This no-sew, non-knit project is probably one of the quickest crafts you can design. It also makes for the perfect going out accessory or gift. The variegated baby yarn will give you a pop of color that’ll brighten up your day. So with just 10 minutes of your time, why not squeeze in this fun way of designing your own scarf to your crafts to-do list?